We always had cats growing up and I can't imagine not having one in the house. We had a much loved family cat who died when he was 16. I had him from the age of 8 to 24 so really, we grew up together. The day he had to be put down was a sad day for our family and years later, we all still talk about him regularly. About a year after that cat died, I became desperate for a cat of my own. I was like a broody woman wanting a baby. At the time, we were living in New Zealand, where cat ownership is high (much to the detriment of the local wildlife!). There were cats everywhere and the day that Mr HNW caught me trying to tempt the neighbour's cat to come in to the house with a saucer of milk was the day he realised we needed to get a little cat of our own. Our big concern was that we knew we were not going to be in New Zealand forever, but after some discussion we decided the cat would just have to come with us when we left and that was that. One Easter weekend we went to the Wellington SPCA. The staff were very busy because it was an "adopt-athon" day and there were lots of prospective cat and dog owners in. They asked us four or five questions and then instead of bringing us into the main cat area brought us into the administrative office. There were so many kittens that needed homes that there were two cages in there with a litter of kittens in each one. They pointed us to one cage, said these cats love people and left us to it. I opened the cage and a little black and white cat crawled up my arms and fell asleep in the crook of my elbow, purring loudly. I knew then that this was my cat and Murdoch has been with us ever since. When we left New Zealand, Murdoch came with us on a three day trip across the world to get him home to Dublin. The trip involved two long car journeys, three flights and a ferry crossing and it cost a small fortune to bring him back but it was worth every penny. It's a story for another time I think. Murdoch, is in fact, very good with J. He is a gentle cat at the best of times but now that J can grab and move about he really has a chance to show that. When they are near each other I watch them carefully in case Murdoch suddenly turns but he just walks off when J gets a bit rough. If J is crying Murdoch will come and sit next to him and give him headbutts (cat kisses) and when Murdoch walks past J starts giggling like it is the funniest thing he has ever seen. I know some people will probably think I'm a terrible mother for letting J and Murdoch sleep like in the photo below but it works for us and I just think it is the cutest thing ever. 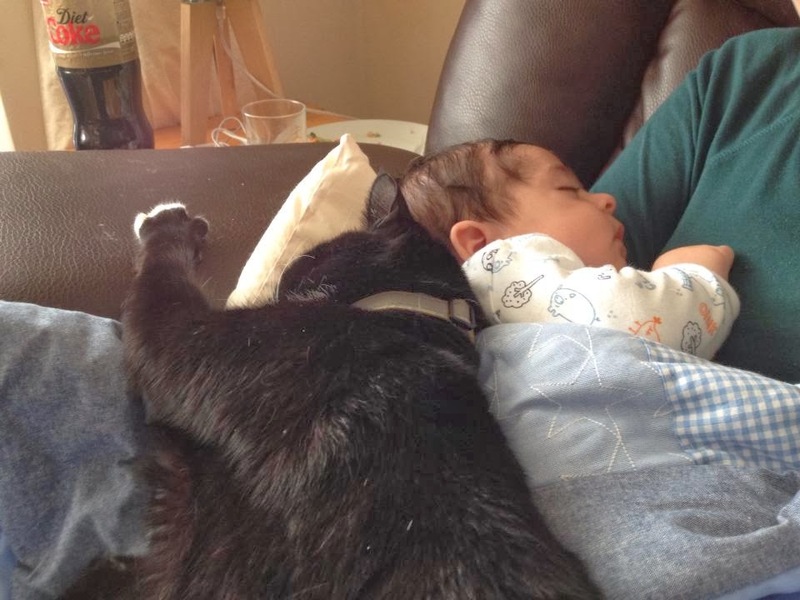 So, there really is no reason that pets and babies are not compatible. J and Murdoch already have a little bond and it's lovely to see them together. I wouldn't be surprised in the least if J's first word is Murdy. As long as you are smart about it and take a few precautions what''s the problem? If I could get ten more cats I would but Mr HNW has vetoed it. Apparently 11 cats, one baby and two parents in a two bedroom apartment is "not a good idea". We'll see!